For public librarians, I would suggest browsing a copy from ILL as there is some good material but I find Storytime Magic to be more applicable to the public library setting. It would be useful to presenters who perform storytimes for school-age kids. I did really like the third chapter, "Welcome to the Library," as it lays out a great program for those orientation visits that are so popular with Scout troops and classroom teachers. Likewise, chapter 4 "Welcome to Kindergarten" would be a great starting point for a "Back to School" storytime in the late summer. I know many libraries do an annual gingerbread house making program. If you want to add a storytime to that tradition, with all apologies to the Apple Store, there's a "chap" for that. It's 17. I've also heard of libraries who throw a New Year's Eve Countdown for kids at 11:30 a.m., which I think is adorable. Chapter 19 is all about The New Year. Another holiday it can be hard to find ideas for gets its due in chapter 30: St. Patrick's Day. The rest of the topics are pretty standard for storytime planning books. There are chapters on: nutrition and food, nocturnal animals, the five senses (sidebar: someone needs to do a storytime on the 6th sense! ), different seasons, transportation (which includes My Dump Truck Fred), fairy tales and folklore, dinosaurs, weather, zoo animals, farm animals, etc. All chapters also include options for incorporating American Sign Language (ASL) and Spanish. In addition, there are also skill-building games to help kids learn to use the library as well as "takeaway activities," some of which would make good crafts to follow storytime. One thing I did like as someone who has invested a lot of time and felt into making patterns from the previous book is this book uses many of the same pieces with different stories. You may have to make 1-2 additional pieces, depending on the story. This is so helpful. I know I struggle to think of how to recycle pieces in this way and there are some wonderful stories. Judge a professional reference book by # of pages marked! In my opinion, this is a great resource for our friends working in elementary school libraries. One of the reviews on Amazon criticized it for promoting flannel stories when smart boards and document cameras are all the rage, which was so sad to me. In my experience, even elementary aged kids are just as fascinated by good old-fashioned storytelling done by a gifted performer as they are by all the fanciest technologies in the world. If you don't have time to make flannel pieces, MacMillan and Kirker suggest the option of converting their felt stories into prop stories. This is pretty genius, if you ask me. 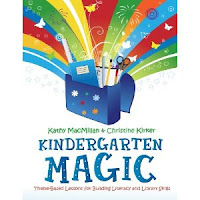 As with Storytime Magic, Kindergarten Magic has associated activities that you can print off the Internet.I wish more publishers would do this as my copy machine can be so fussy when I am trying to copy off flannelboard patterns from professional reference books. I was a little disappointed that some of these were repeats from the previous book, although I understand how much work must go into putting a resource like this together. One of these that jumped out at me was the texture book craft, which is one of my favorites from Storytime Magic. Has anyone seen this book? Or planning to check it out now? Let me know what you think!